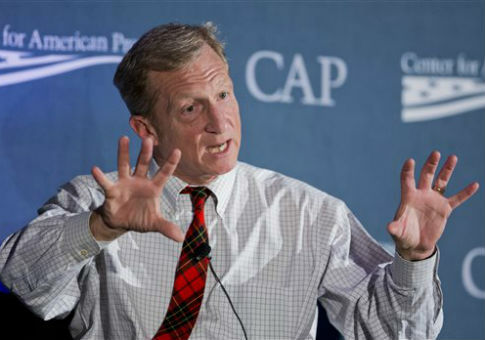 Billionaire Democratic donor Tom Steyer’s vehicle for environmental grantmaking has a stake in a private equity firm that is invested in green energy companies, the group confirmed last week. The TomKat Charitable Trust was "[e]stablished in 2009 with funding from Tom Steyer and Kat Taylor," according to a spokesman, who said that the nonprofit foundation is a limited partner in BrightPath Capital Partners, L.P.
Kat Taylor is Steyer’s wife. The firm is invested in at least three green energy companies. One of those companies has received federal subsidies and was under investigation as late as February into whether it misrepresented financial information to obtain those subsidies, documents obtained by the Washington Free Beacon reveal. Steyer and Taylor put up nearly $175 million to start TomKat in 2008. Since that initial cash infusion, most of TomKat’s revenue has been investment income—more than $72 million, compared with just $2 million in contributions to the group. Some of TomKat’s investments are run by Farallon Capital Management, the firm Steyer founded and helmed until his political foray in 2013. However, unlike Farallon, BrightPath is listed on TomKat’s annual filings with the Internal Revenue Service as a "controlled entity." TomKat listed more than $21 million in contributions to BrightPath on its 2012 and 2013 IRS filings. It reported receiving more than $7 million in distributions from the firm that, according to those filings, shares an employer identification number with TomKat. "It’s not uncommon for a 501(c)(3) to acquire assets and build an endowment which it then invests in order to spin off income in furtherance of the exempt purpose of the (c)(3)," said Dan Backer, an attorney specializing in campaign and nonprofit tax law. "It is, however, very surprising that the (c)(3) would do so ‘in-house’ as opposed to using an outside, independent agent for such work," Backer added in an email. Steyer and Kat Taylor, his wife, do not draw income from the firm, according to TomKat. Returns from its stake in BrightPath "are directly re-invested into the Trust’s charitable endeavors," the spokesman said. "Neither Steyer nor Taylor personally benefit financially from any of the Trust’s investments." The funds recycled into TomKat’s charitable operation support a grantmaking operation that in 2013 doled out nearly $35 million to some of the nation’s top left-wing environmental policy and advocacy groups. They included $2.3 million in grants to the Center for American Progress, where Steyer is a director, and contributions to the Sierra Club, the Natural Resource Defense Council, and the League of Conservation Voters. TomKat has also passed along contributions to some of Steyer’s other nonprofits, including the Center for the Next Generation, the 501(c)(3) sister of his political outfit. Next Generation recently announced that it would shutter its climate policy operation. But that operation was alive and well as TomKat poured millions into BrightPath. On September 22, 2009, according to technology industry website CrunchBase, a Steyer-backed venture capital firm called Greener Capital invested $6 million in California solar company Sungevity. At the time, both Steyer and Sungevity were working to prevent a rollback of California’s aggressive carbon emission restrictions. Steyer was the undisputed leader of the campaign to defeat the measure, known as Proposition 23. He co-chaired the No on 23 effort, and donated at least $5 million to help defeat the measure. "Someone had to be in charge, and Tom stepped up and really played the CEO role," Michael Kieschnick, CEO of CREDO Mobile, a phone company with an activist arm that worked to defeat the measure, was quoted as saying. Sungevity employees also donated to an anti-Prop 23 political committee. The company hosted Steyer and other well-heeled environmentalists at its offices for a fundraiser for anti-Prop 23 groups. Sungevity CEO Danny Kennedy would credit Steyer with leading the successful charge to defeat the measure. Kennedy would also speak at a Next Generation event on the tremendous amounts of money to be made in green energy. "Renewable energy will be many, many times more profitable than fossil fuels in a very short amount of time," as Next Generation described the panel. A month later, after Prop 23’s defeat, BrightPath invested in Sungevity. It was the first of five funding rounds in which the firm would participate, according to CrunchBase. Greener Capital would join in two of them. A month after BrightPath’s second equity investment in Sungevity, the company began receiving green energy subsidies from the federal government. Since February 2012, it has received more than $12 million in grant money through the Treasury Department’s stimulus-funded 1603 grant program. A conservative group called the Patriots Foundation last year requested copies of all Sungevity applications for 1603 grants that resulted in an award. In a January response to that request, Treasury suggested that the scope of federal support for the company could be massive. "An initial query within the Office of the Fiscal Assistant Secretary identified approximately 1,067 potentially responsive applications. I estimate that there are more than 53,350 potentially responsive pages," a department FOIA officer responded. Asked to clarify whether those were grant applications that actually resulted in an award, the department responded that it had found "1,067 applications and supporting materials submitted by Sungevity, Inc for Section 1603 awards." Sungevity did not respond to questions about its applications for 1603 grants, or the federal investigation into how it obtained those awards. Treasury’s Office of Inspector General, which is responsible for investigations, would not comment on the status of that one specifically, suggesting that it is still ongoing. "Section 1603 is a high-impact and high-visibility program involving a significant amount of public funds," said OIG spokesman Rich Delmar. "Thus it has a high priority in our audit and investigative plans." Reportedly, Treasury’s investigation is probing whether Sungevity and two other solar companies accurately reported the costs of installing solar panels when applying for grants. Sungevity, SolarCity, and SunRun were subpoenaed in 2012 for documents related to their 1603 applications. Additional documents obtained by the Patriots Foundation reveal that the investigation was still ongoing in February of this year. The group’s FOIA request for documents concerning that investigation was denied in its entirety due to an exemption to the law that allows federal agencies to withhold documents that "could reasonably be expected to interfere with enforcement proceedings." "I am withholding all records, documents, and/or other material, which if disclosed prior to completion [of the investigation], could reasonable be expected to interfere with law enforcement proceedings and final agency actions related to those proceedings," Treasury wrote in its February 13 letter. The investigation was first reported in December 2012, but BrightPath has participated in three more funding rounds for Sungevity since then. BrightPath managing partner Rob Davenport referred questions to TomKat, which insisted that its stake in the firm supports its charitable endeavors and does not benefit Steyer. "It’s like a closed loop of cronyism," said William Yeatman, a senior fellow at the Competitive Enterprise Institute specializing in energy and environmental policy. "Steyer’s political giving fuels policies that enrich his friends, while at the same time it also bolsters the resources used by advocacy groups that lobby for these same policies," Yeatman said in an email. In addition to its ties to TomKat, BrightPath is also affiliated with Beneficial State Bank (formerly One PacificCoast Bank), founded by Steyer and his wife, Kat Taylor. The bank listed BrightPath as a "partner provider" in its 2012 annual report. Davenport sits on its board. "We seek market rates of return on a risk adjusted basis, but we have a very rigorous screening process," explained Davenport at a 2012 event on "socially responsible" business. "If we can’t identify and ultimate measure social impact delivered by the businesses that we consider, then we probably don’t do it." Also on the panel was Kat Taylor, the bank’s chief executive, who said that it works to be financially sustainable while also serving social and ideological goals. Davenport, who also sits on Sungevity’s board, agreed with the importance of socially responsible investing, but stressed the need to produce returns for its investors. "We seek to get a return on capital such that we can go back to our limited partners and prospective limited partners and say, ‘Hey, this is a profitable activity, and we need to do more of it, so invest in our fund so we can put that money back to work in the marketplace.’"
This entry was posted in Politics and tagged Democratic Donors, Green Energy, Tom Steyer. Bookmark the permalink.